In 2011, the TAS board voted to formally name the 2.2-acre campus the society occupies on Sunset Drive in honor of longtime environmentalist, birder and board member Alan Steinberg. Our grounds, comprised of rare Pine Rockland and Hardwood Hammock, have since been known as The Steinberg Nature Center. 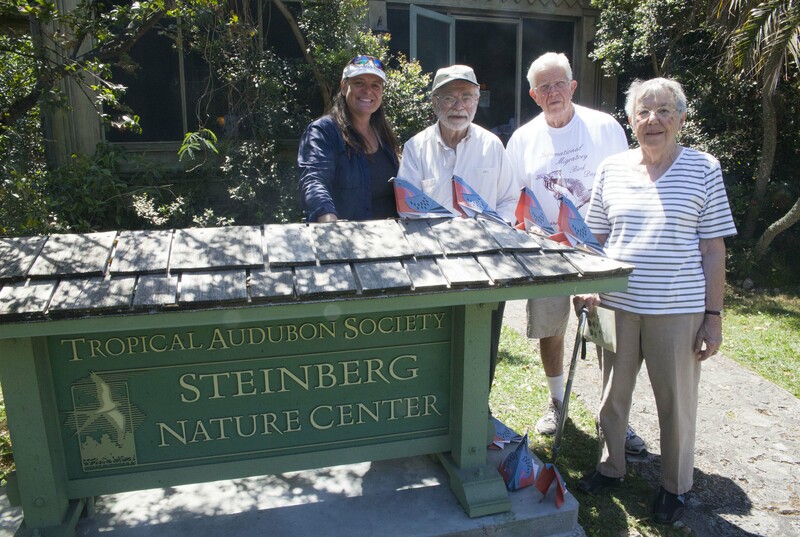 It was so dedicated in March 2012 in acknowledgement of Steinberg’s significant contributions — both financial and pro bono — over more than 30 years of service to Tropical Audubon. The near-native grounds encompass self-guided Nature Trails, water features, picnic areas, an outdoor kitchen and large chickee under which educational seminars and fundraising events are held. Volunteer work parties regularly scour the property for invasive species and maintain butterfly gardens, understory plantings and a plethora of trees that serve as food and shelter for migrating birds. Indeed, the Steinberg Nature Center serves as a significant green island in a vast sea of suburbs and concrete. Birds seeking safe haven and nourishment can readily hopscotch here from the University of Miami Arboretum, which lies just one mile north as the crow flies. Green islands such as ours and UM’s are critical to species survival.